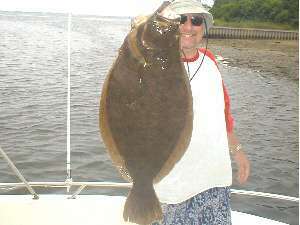 On Friday August 8, 2003 James Tully and friends were fishing near the sea buoy off Shinnecock Inlet. That's when he hooked and landed this 8 pound 12 ounce fluke aboard his friends boat, the "Motley Crew" Sean and Tim Motley assisted in helping me net the big guy! Great fishing and great friends it doesn't get much better than that. If you would like to see a live web cam shot of the Shinnecock Inlet please click here. Shinnecock Inlet is located in the Hampton Bays on Long Island. The inlet is a 9,000 acre salt marsh habitat which can trace its origins back to a hurricane in 1938. Since then extensive dredging and stone jetties have become the wonderful jewel know as Shinnecock Inlet. This area is popular with fisherman, divers and sailors. The striped bass, bluefish, and fluke are frequently caught by saltwater anglers here.The area is also home to a large abundance of birds and other aquatic life. Shinnecock Inlet has many Party Boats, Charter Boats, and Guides who would be happy to show you a wonderful time. If you would like to see a list of Charters and giudes please click here.